Work toward maximum physical fitness, improve your health and strengthen cardiovascular function using the Viavito Rokai rowing machine that tones virtually every major muscle group in your body. This folding, multi-function rower lets you target core, hamstrings, glutes, lower, middle and upper back, shoulders, arms, biceps, triceps, chest, abs, legs, buttocks and obliques with little pressure on the joints to ensure total-body muscular strength and endurance. 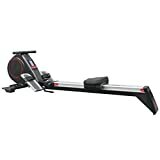 For effective and enjoyable workouts there are 16 silent, friction-free magnetic resistance levels and the machine benefits from a 6kg (13.2lbs) flywheel to keep your rowing smooth. Use the 12 scalable pre-set workout programmes to get your heart rate up or challenge yourself choosing race (where you compete against the computer), manual, user-defined and heart rate control options. To keep you entertained, there is also a recovery test and interval training, plus it is quick and simple to fold the rail up and move the Rokai for convenient and practical storage. The LCD console displays your data as you row and the pivoting pedals and large footplates promote a correct and comfortable rowing action and help decrease the likelihood of injury. What’s more, you can buy with confidence knowing that it’s covered by a 2 year parts and labour warranty.